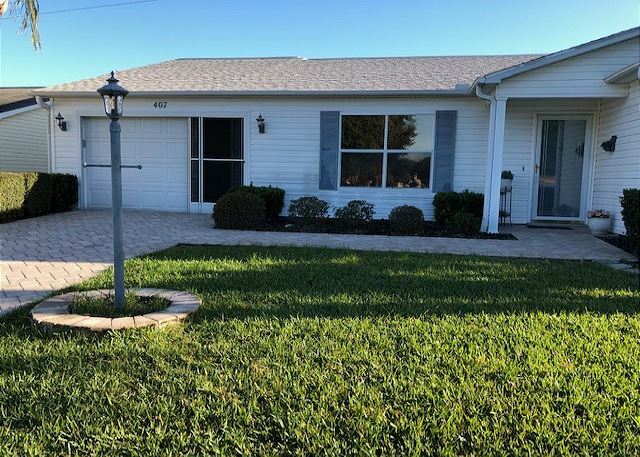 Lady Lake, Florida United States - HOT TUB AND PAR CART FOR YOUR PLEASURE 2 BEDROOM HOME THE VILLAGES | RE/MAX PREMIER REALTY Inc. Very comfortable and nicely furnished ranch home. This home is available now so call and book today. TV's in kitchen, den and master. This home has a hot tub for your enjoyment. Awesome location only minutes to Lake Sumter Landing or Spanish Springs town squares for nightly entertainment, shopping, dining and dancing. Guest room/office has a queen Murphy bed as well as a queen bed in the master bedroom. Master bath has a walk in shower, guest bath has a tub/shower combination, both with glass doors. Garage door has a screen door, the lanai is enclosed with heat and A/C. Washer/Dryer in the garage. Yard well maintained. A guest from Tunnel hill, IL United States recommends this vacation rental.